Wired Ethernet connections are still widespread in businesses where the increased speed and security of wired network connections are desirable. However, wireless networking has increased exponentially in home settings. Many homeowners don't think about wired networking much anymore, but it is still a valuable option for many conditions. Devices in a wired network are usually connected physically to a server or each other with Ethernet cables. Each end of an Ethernet cable has a connector called an RJ45 connector. A Registered Jack 45 (RJ45) connector is a standard type of physical connector for networking cables. RJ45 connectors are used almost exclusively with Ethernet cables and networking. 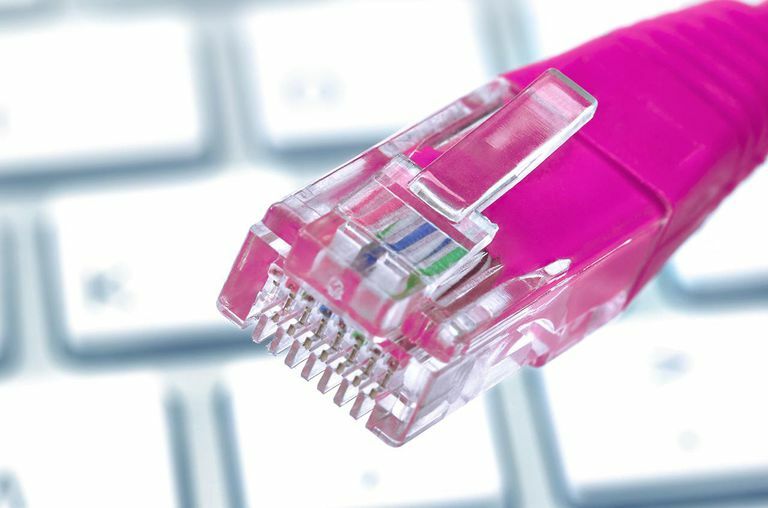 Although Ethernet cables have gone through several generations of speed improvements, the RJ45 connector that appears on the ends of the cables has not changed. Whether you use Category 3 through Category 6 cables, the connectors are RJ45. Category 7 cables can be terminated with RJ45 connectors, but they are specialized versions called GigaGate45 (GG45). The GG45 connectors are backward compatible with RJ45 connectors. Ethernet cables feature small plastic plugs on each end that are inserted into the RJ45 jacks of Ethernet devices. The term "plug" refers to the cable or "male" end of the connection while the term "jack" refers to the port or "female" end. RJ45 plugs feature eight pins to which the wire strands of a cable interface electrically. Each plug has eight locations spaced about 1 mm apart into which individual wires are inserted using special cable crimping tools. The industry calls this type of connector 8P8C: shorthand for "eight position, eight contact." Ethernet cables and 8P8C connectors must be crimped into the RJ45 wiring pattern to function properly. Technically, 8P8C can be used with other types of connections besides Ethernet; it is also used with RS-232 serial cables, for example. However, because RJ45 is by far the predominant usage of 8P8C, industry professionals often use the two terms interchangeably. Traditional dial-up modems used a variation of RJ45 called RJ45s, which feature only two contacts in 8P2C configuration instead of eight. The close physical similarity of RJ45 and RJ45s makes it difficult for an untrained eye to tell the two apart. However, they are not interchangeable. Two standard RJ45 pinouts define the arrangement of the individual eight wires needed when attaching connectors to a cable: the T568A and T568B standards. Both follow a convention of coating individual wires in one of five colors — brown, green, orange, blue, or white — with certain stripe and solid combinations. Following either the T568A or T568B convention is essential when you build your own cables to ensure electrical compatibility with other equipment. If you don't build your own cables, you only need to verify the correct standard for use with your equipment. For historical reasons, T568B is the more popular standard, although some homes use the T568A version. The table below summarizes this color coding of the wires in the connectors. Several other kinds of connectors closely resemble RJ45s, and they can be easily confused with one another. The RJ11 connectors used with telephone cables, for example, use six position connectors rather than eight position connectors, making them slightly narrower than RJ45 connectors. Other than that, they look very much the same. RJ45 connectors do come with some problems. To form a tight connection between the plug and the network port, some RJ45 plugs make use of a small, bendable piece of plastic called a tab. The tab creates a tighter seal between a cable and a port on insertion, requiring a person to apply some downward pressure on the tab to unplug it. The tab prevents a cable from accidentally coming loose. Unfortunately, these tabs easily break when bent backward, which happens when the connector snags on another cable, clothing, or some other nearby object. Most RJ45 connector problems occur when the wires don't follow the prescribed standard. People who prefer to work on their own cables and connectors must pay close attention to the proper wiring sequence to avoid problems.